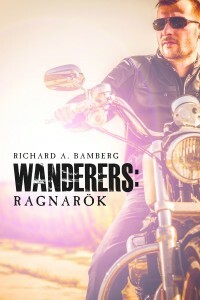 Welcome to fellow author and former long-term critique partner Richard Bamberg, author of the Wanderers urban fantasy series and other novels. Previous interviews with Rob Chansky, P.R. Adams, and Megan Rutter are also available. 1. You and I were in a critique group together when this book was first being developed. (Full disclosure to the audience: I finally read the final-final version only recently because I’m a terrible person.) One of the things that stuck with me was that said a few times that you didn’t know where a certain scene was going and just wanted to see how your early readers would react before writing the next scene. What benefits did you get out of doing that, besides leaving your early readers hanging on the edge of a cliff? And has your pantsing vs. plotting quotient changed or have you always been that crazy? Yeah, sometimes I have no idea what happens next. When I was still having early readers tolerate my horrible early drafts, I’d get some great ideas from their feedback on what directions a novel would take. Sometimes they’d come up with something so surprising that I had to change where my overarching plot line was headed. I’ve always been a chronological thinker. I come up with a scene that would make a good opening for a novel. Once I’ve written that scene, I step back and consider just what would make sense for that scene to become a story. I’ve tried plotting an entire novel and did so only once. I found it tedious and trying to stick to the outline kept spontaneity out of my plot. Granted, some of the best novels ever written were done by plotting the story out before the first word was written, but that’s not me. My limit of plotting these days, after that opening scene is finished, is to come up with a vague ending. For instance, in Wanderers: Ragnarök, I had the meet-cute scene of Raphael riding into town on his manticore possessed Harley and saving Cynthia from a nasty little demon. Of course, nothing can be straightforward so I had to throw a twist into the opening. From that opening, I sat back with a glass of…well; it had alcohol in it, bourbon? Probably, or maybe scotch on the rocks. Anyway, while sipping whiskey, I decided that any good story needs a big finish. From that proven concept, I decided what the climax would need. Then it was just a matter of connecting the opening to the ending. Granted, there’s no such thing as a straight line in writing, but in an effort to make the characters come alive, I give them a lot of leeway to surprise me. In each scene, I find good characters saying and doing things that were not in my head when I started the scene. It keeps the story interesting for me and hopefully for the reader. It’s doesn’t all lead to hugs and puppies–Buffy the Vampire Slayer: Once More With Feeling, so many times I have to throw out my character’s great idea and substitute a more mundane one of my own. 2. What brought you to write this particular book and series? I seem to recall that you might be a wee bit of a slight fan of Supernatural and The Dresden Files, but what brought you to write this particular story (rather than something else in the urban fantasy/contemporary fantasy genre)? What’s driving you to finish a huge series like this? I actually started this series about the time Supernatural first aired on television. It may have been the WB back then, but now it’s the CW (where do they get their names?). I’d been a huge fan of Buffy and all things Josh Whedonish. Buffy had a great run. When Supernatural came out, I have to admit that I watched the first two episodes and then stopped watching it. A year later, one of my oldest and dearest friends and fellow writer, Del Stone Jr. sent me the first season of Supernatural on DVD. Well, I couldn’t tell him that I hadn’t been watching it. (In my defense, the Supernatural team rates that second episode “Wendigo” as their worst episode in 12 seasons.) I now have the first 11 seasons of Supernatural and never get tired of the Winchester boys and Babe–for the uneducated, that’s their 1967 Chevy Impala. Anyway, I’d found a real fondness for contemporary fantasy and I thought I’d give it a try. The concept of Wanderers and Raphael A. Semmes in particular, is based on the thought of someone who has found a calling, a reluctant calling, but heroes seem to me to be more a matter of being in the wrong place at the right time. Wanderers are longed lived powerful magic wielders who are reaped from the battlefield by Valkyries. They serve Verðandi, one of the Norn sisters of Norse mythology. Raphael, Rafe to his friends, didn’t volunteer for the job, in fact; he’s always been under the impression that Fate has placed a geas on him that he cannot escape. It’s the idea that the hero doesn’t really have a choice in the matter that appealed to me at first. The Wanderer is a lonely soul, roving from place to place, fixing problems that Fate has identified as needing his particular form of attention. He develops few friends, has no home, and doesn’t control his own destiny. I guess it was the idea that so few of us can really chose our own fate that sent me into this series. 3. Your hero is a Vietnam vet with a Harley and a smartass, yet practical, attitude. What, if anything, do you admit to having in common with him? (Note: If I don’t get a story out of this question, I’ll know for a fact you’re lying.) Also, do you feel like the character comes mostly out of yourself as far as an attitude toward life goes–and does that make him more fun to write? Do you make anything over the top out of wish fulfillment? Story? That’s what I put in novels. In common with my protagonist? I’d be lying if I didn’t say that all of my protagonists have some part of me at their core. Rafe could be what I’d be, if God had asked me what I wanted to be in life. He’s handsome, smart, sometimes amusing, and a bit of a ladies man…if that’s still a thing. He’s a free spirit that answers to no one (if you don’t count Fate) and travels the roads that lead to that next adventure, just over the rise, where the grass is always greener, the ladies friendlier, and death is just a slipup away. I’d like to say that I have his devil-may-care attitude toward life and danger, but that’s where I depart from my protagonist. I could say that I have his situational morality, but I’ve never considered my morality to be truly situational. Sure, I believe bad guys should always get their comeuppance whether a government’s legal system plays into that or not is immaterial to Rafe and mostly to me. Our justice system is a misnomer just as calling our government a democracy is an error. Our justice system is a system of laws and justice has little to do with our lawyers and judges. Our republic has never been a democracy. What Rafe gets from me is belief that I’d call libertarian, the lower case “l” being deliberate as it has nothing to do with the Libertarian Party in this country. It’s more like Stan Lee’s Spiderman’s saying: “with great power comes great responsibility.” In Rafe’s case, he has the power, answers to almost no one, but doesn’t abuse his power. He does, however, set himself apart as judge, jury, and executioner when necessary. There was a time, long ago, when I considered–briefly–casting my responsibilities aside and riding off into the sunset on my motorcycle (no, it wasn’t a Harley). But like so many dreamers–what writer isn’t a dreamer–I held onto my life of responsibilities, of putting family ahead of dreams. It’s been said that writers write of things that they know they’ll never do. I’ve had my share of little adventures over the years, my first being a tour of Vietnam that, regardless of what I say to family and friends, did affect my life every day since my return. 4. I know that some of your earlier work was released on audio first (although I can’t remember what the name of the company was). Do you have any plans to do audio on any of these books? I am planning to submit a few of my newer books to Books in Motion and see where that leads. It’s a nice market that originally catered to having displays in truck stops across the west. You could pick up a title in Washington state, drive for 15-20 hours, and then exchange the title for another at one of their many locations. These days I believe you can download the titles from anywhere and then exchange it later. Having a novel on audio is a bit of a kick, assuming you have a good reader. I was lucky with the first three novels they released and all three had decent readers who brought along their own followers. For those interested, Books in Motion can be found at: https://www.booksinmotion.com/. If you’re an author, they have simple guidelines for submitting published work to them. 5. This is the first book in what you’ve said is going to be a longer series, but one of a definite length (I forget how many books, like twelve?) and an overarching plot, and you’re working on book 4 now. Geeky writer question, what techniques are working for you in opening the various books to keep your readers grounded? Are you trying to leave room for new readers to pick up books in the series as they come out (then hopefully double back to the beginning), or do you just write the opening as it comes to you? I may or may not be struggling with this at the moment myself–I mean, inquiring readers want to know. Your memory is better than mine. When I started Wanderers I really hadn’t expected it to be a series, but favorable feedback on the protagonist–and that it was a fun story to write–led me to concluding the first story with a setup for a sequel. By then I’d decided that I enjoyed writing about Raphael and Beast and thought I could make a nice series out of it. The length of the series is not firm in my head right now. I’m enjoying writing book four and I bring in new and some old characters that should make sure Rafe and his Apprentice, Therese, have plenty to keep them busy for years to come. As for a definitely series length, well round numbers are nice, but so is a dozen. I guess that will remain a mystery for now. On a favorable note, I’ve recently turned to full time writing and I’m intending to complete a novel every six months or so. They won’t all be in the Wanderer series, but a minimum of one per year will be. Ha, I would like to say that I always welcome comments from my audience. While my website has crashed, I have someone feverishly trying to get it back on line and as soon as it’s up I’m going to start giving away copies of some of my eBooks to people who are interested in following my work. I’m going to be at GalaxyFest (http://www.galaxyfest.org/) February 24-26,2017 at The Antlers Wyndham Hotel in beautiful Downtown Colorado Springs, CO. Stop by and see me, I’ll have hard copies of most of my novels available and everyone who gives me some kind of contact information (email address) will be entered in a giveaway of autographed novels. I’ll give one of each of the non-Wanderer series books (5 currently available) to five different winners and then give the complete (so far) set of the Wanderer series to one lucky winner. As an added bonus (this is starting to sound like an infomercial about Ginsu knives) I’ll throw in a signed copy of Wanderers 4, when it is released later this year. Richard Bamberg was born in Alabama, to middle-class working parents. After high school, he enlisted in the USAF. He later earned a degree in engineering from Texas Tech and went on to work for Boeing and the Missile Defense Agency. He sold his first novel, Emerald Eyes, to Books in Motion in 1994. Since then he’s published ten novels and numerous short stories. His work has appeared internationally in print and on-line in science fiction magazines as far away as Poland. His short stories have also appeared in USA publications, including the award-winning anthology Bending the Landscape. His works have ranged across thrillers, horror, and science fiction; lately his focus is on urban or contemporary fantasy and has two on-going series: The Wanderers and The Hunters. His hobbies, when not writing, have included fencing, shooting, fishing, RPGs, computer games, and reading. He’s an avid fan of SpaceX and their goal for occupying Mars.